The basic past Arabic verbal sentence الجُمْلَة الفِعْلِيَّة [al-jumlah al-fi‘liiyah] can be a word or a group of words that express a complete action. It starts with a verb فِعْل [fi‘l] which is always followed by a subject فَاعِل [faa‘il] (i.e. the doer of the action). If the verb is intransitive لَازِم [laazim], it with the subject forms a complete meaning. If the verb is transitive مُتَعَدِّي [muta‘addii], it, besides the subject, requires an object مَفْعُول [maf‘uul] which completes the meaning of the sentence. 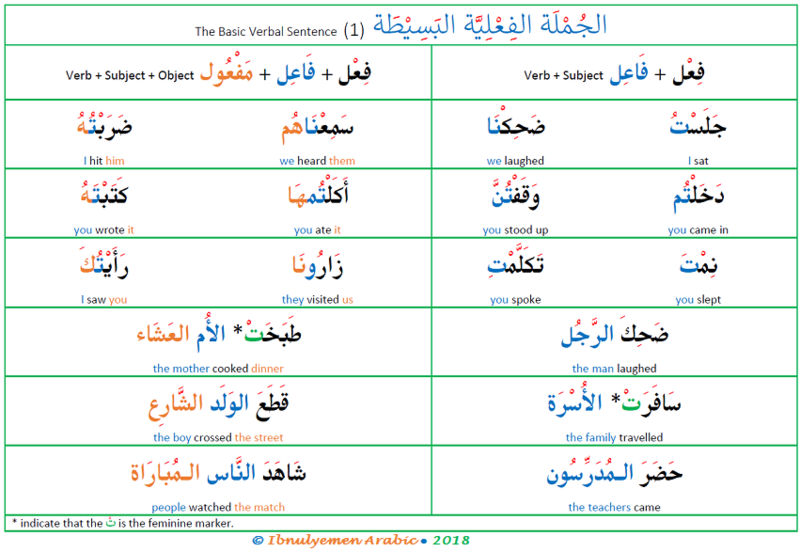 So, the basic Arabic verbal sentence can be: (1) verb + subject or (2) verb + subject + object. Both may be followed adverbial phrases of place, time, or manner. In this lesson, the focus is on sentences that begin with the perfective (past) verb الفِعْلُ المَاضِي [al-fi‘l al-maaDHii]. Sentences that begin with the imperfective (present) verb الفِعْلُ المُضَارِع [al-fi‘l al-muDHaari‘] will be explained in the next lesson. a) These are one-word sentences because the subject الفَاعِل is an attached pronoun (in orange). b) In (3) and (8), the subject الفَاعِل is covert مُسْتَتِر, that is هِيَ and هُوَ, respectively. c) The verb الفِعْل and subject الفَاعِل may be followed by adverbials: (4), (5), and (8). a) These are two-word sentences (verb + subject – فِعْل + فَاعِل) because the subject الفَاعِل is a noun. b) Since the verb الفِعْل precedes the subject, it does not agree with it in number. It agrees with it in gender only, as in (6) and (10). This is indicated by the feminine marker تْ. c) The verb الفِعْل and subject الفَاعِل may be followed by adverbials as in (8) and (9). d) A pronoun does not appear separate after verbs. Instead, its corresponding attached pronoun is added to the verb, as you saw with one-word sentences above. (5) صَفَّقَ النَّاس – people clapped. a) In these sentences, the verb الفِعْل, the subject الفَاعِل (in orange), and the object المَفْعُول (in blue) are combined in one word. That is, one-word represents a complete sentence. b) The subject الفَاعِل may be covert مُسْتَتِر, as in (4) and (5). In (5), the تْ is not a subject; rather, it is the feminine marker. c) After the object المَفْعُول, an adverbial may be added, as in (8), (9), (10), and (11). b) When the subject الفَاعِل is a singular or plural feminine noun, the verb الفِعْل must agree with it in gender, as in (2), (5), and (9). This is indicated by the تْ. c) The object المَفْعُول may be followed by an adverbial, as in (6), (7), (8), (10), and (11). (1) شَرِبَ الطِّفْل الحَلِيْب – the child drank the milk. (5) عَالَجَتْ المُمَرِّضَات المَرْضَى – the nurses treated the patients. * If you have a question or need further clarifications, feel free to post it in the comment below.